The California State Athletic Commission has medically suspended 11 athletes who competed in this past Saturday’s “UFC on FOX: Shogun vs. Vera” event. 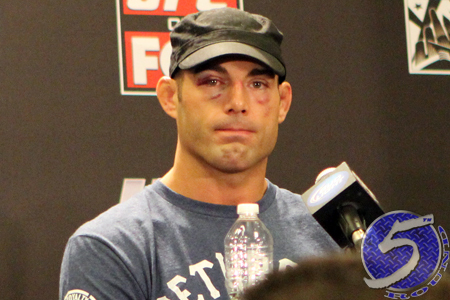 Despite posting a vicious 2ndRound knockout victory, Mike Swick (Pictured) was issued a substantial ban. The welterweight, Jamie Varner and Oli Thompson could each be riding the pine for up to 180 days. However, they can all return to action sooner with a physician’s approval. DaMarques Johnson, the man who found himself on the business end of Swick’s right hand, was levied an indefinite suspension until he receives neurological clearance. Staples Center in Los Angeles hosted this weekend’s festivities. Ulysses Gomez: Suspended 45 days with 30 days no contact for precautionary reasons. Suspended 60 days with 60 days no contact for a cut on his forehead, but can be cleared earlier with doctor’s note. John Moraga: Suspended 60 days with 60 days no contact for a cut on his right eyebrow, but can be cleared earlier with doctor’s note. Oli Thompson: Suspended 180 days with 180 days no contact for a nasal fracture, but can be cleared earlier with doctor’s note. Wagner Prado: Suspended indefinitely or until cleared by opthamologist. Cole Miller: Suspended 45 days with 30 days no contact for precautionary reasons. Suspended 60 days with 60 days no contact for right-hand and left-middle-finger injuries and a suborbital cut, but can be cleared earlier with doctor’s note. days no contact for cut on right eyelid. DaMarques Johnson: Suspended 45 days with 30 days no contact for precautionary reasons. Suspended indefinitely until given neurological clearance. Jamie Varner: Suspended 180 days with 180 days no contact for possible fractured right hand, but can be cleared earlier with doctor’s note. Ryan Bader: Suspended 45 days with 30 days no contact for precautionary reasons. Brandon Vera: Suspended 45 days with 30 days no contact for precautionary reasons. Suspended 60 days with 60 days no contact due to a suborbital cut, but can be cleared earlier with doctor’s note. Mauricio “Shogun” Rua: Suspended 45 days with 30 days no contact for precautionary reasons.